Animations fan, especially Despicable Me lovers must be glad to know that Despicable Me 3 will be release in Singapore on 15th Jun 2017. You can catch the special appearance of GRU & Minions on 21st May 2017 at FairPrice Xtra Ang Mo Kia Hub @ 11am and FairPrice Xtra Jem @ 2pm! If you are one who is interested in all Despicable Me or Minon’s collectibles, you need to know that you will be able to redeem a limited edition Despicable Me 3 bag (four different designs available)! Just purchase two 1-litre packs OR one 2-litre bottle of MAGNOLIA Fresh Milk, OR two bottles of MAGNOLIA Yoghurt Smoothie (800ml) at participating supermarkets, hypermarkets and convenience stores, only while stocks last! You can also get your children (or yourself!) 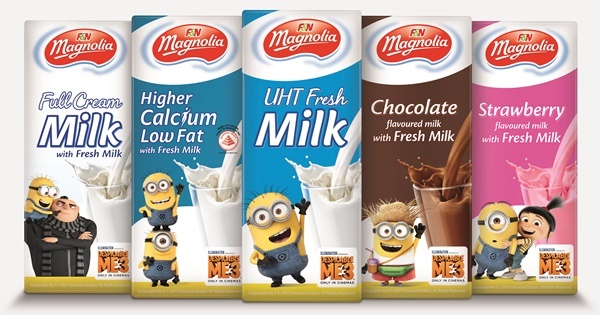 the exclusive Despicable Me 3 sticker sets, which comes with every purchase of MAGNOLIA UHT milk pack (6 packs of 250ml or 6 packs of 230ml). MAGNOLIA Lo-Fat Hi-Cal variants have been certified as Healthier Choice by Health Promotion Board (HPB). As mentioned in my previous post, I can easily finish a 1 liter pack of MAGNOLIA Plus Oats all by myself and I think the new handy 500ml pack is really good for breakfast on-the-go. Click here to find out more details on the roadshows detail for this promotion.